As of October 23, 2012, five thousand two hundred and one [4,725 cases tabulated] human West Nile virus infections have been reported to CDC ArboNET from Alabama, Arizona, Arkansas, California, Colorado, Connecticut, Delaware, District of Columbia, Florida, Georgia, Idaho, Illinois, Indiana, Iowa, Kansas, Kentucky, Louisiana, Maryland, Massachusetts, Michigan, Minnesota, Mississippi, Missouri, Montana, Nebraska, Nevada, New Hampshire, New Jersey, New Mexico, New York, North Carolina, North Dakota, Ohio, Oklahoma, Oregon, Pennsylvania, Rhode Island, South Carolina, South Dakota, Tennessee, Texas, Utah, Vermont, Virginia, Washington, West Virginia, Wisconsin, and Wyoming. About 35% of the total cases were reported from Texas. Neuroinvasive disease cases comprise 51% of the reported total for the year with the remaining 49% recorded as nonneuroinvasive disease cases. 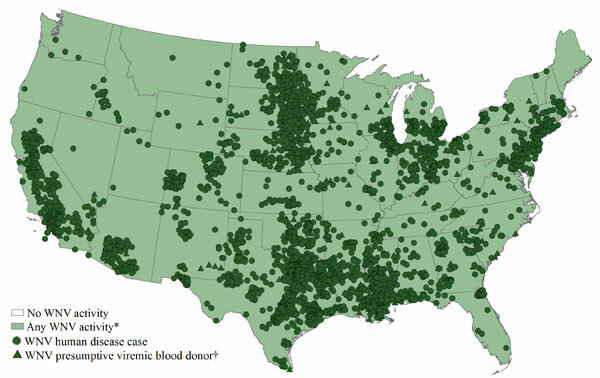 Five hundred and sixty two WNV presumptive viremic blood donors (PVDs) have been reported at this time, CDC said. Incidence by state map data description: West Nile virus neuroinvasive disease incidence maps reflect surveillance reports released by state and local health departments to CDC’s ArboNET system for public distribution. 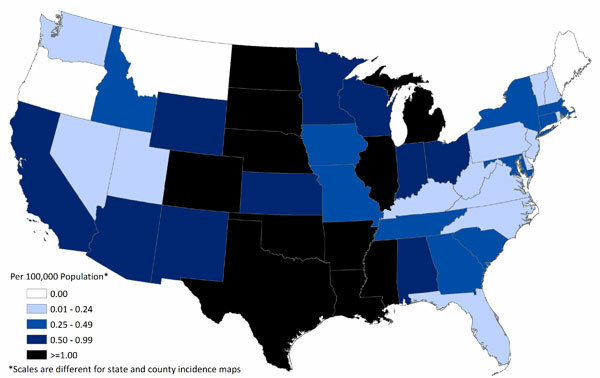 Map shows the incidence of human neuroinvasive disease (encephalitis, meningitis, and/or acute flaccid paralysis) by state for 2012 with shading ranging from .01 to 0.24, 0.25 to 0.49, 0.50 to 0.99, and greater than 1.0 per 100,000 population.